It’s not an Edwardian octoplex full of grime and grifters. It’s not even on Bunker Hill. But we’re going to tell the tale of the Architects’ Building, and if not to you, faithful OBHer, then to whom? All and sundry weep for the Richfield. It’s not altogether true that everyone turned a blind eye during its ‘68-9 demo. Even the Government knew enough to come on out with its Instamatic and take lots of snaps. The November 1968 Times article “Black and Gold Landmark: End Arrives for LA’s Richfield Building” discusses those architecture students who believed the structure a remarkable example of “Jazz Moderne” worthy of preservation. Wreckers who inspected the building the other day couldn’t believe the beautiful condition it is in. Atlantic Richfield officials, who completed the move of their offices to temporary quarters in Union Bank Square over the weekend, have acknowledged its beauty. The structure is being torn down “with tears in our eyes” they once said. …and that was the end of that. According to Cleveland Wrecking’s general manager, the million-dollar site clearance project, of the block bordered by Fifth, Flower, Sixth, and Figueroa, was the largest ever undertaken in the West. What is this Architects’ Building of which we speak? Who architected this interbellum edifice? Downtown is very nearly defined by Parkinson, and you can’t mention LA without Morgan, Walls & Clements (Stiles sitting in the softest spot of this writer’s heart), and if I mention Walker and Eisen, you’ll say Yaaay! and I’ll agree, and we’ll high-five, and then get cut off and kicked out of wherever we are. It sure is swell to take those Conservancy tours and see all these places, but when the Conservancy cats go back to their digs, they return to a Dodd and Richards. William J. Dodd, student of Jenney and Beman is one of the great Midwestern architects. He came to California and is credited—though scholars still dispute to what extent—with a portion of Julia Morgan’s 1914-15 Examiner Building. This he did with his partner at the time J. Martyn Haenke. In 1916 he partners with engineer William Richards. They produced so many an important Los Angeles structure that I will at some point in the near future add their full history as a comment appendage to this text, to keep from having too many appetizers before our twelve-story entrée. We’re talking about the southeast corner of Fifth and Figueroa, not to be confused with our friend on the kitty-corner to the northwest, the Monarch Hotel. 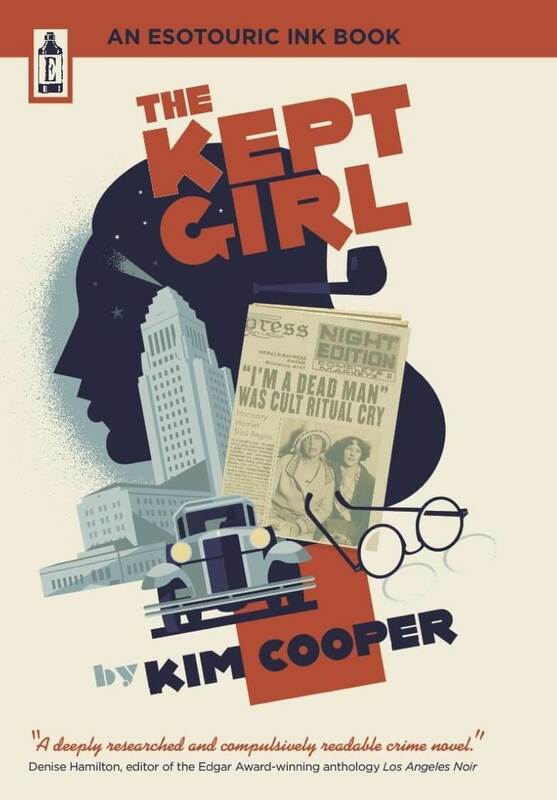 The first rumblings about the southeast corner of Fifth and Figueroa come in February 1926, when mention is made of preliminary plans and lease negotionations for a million-dollar skyscraper to house LA’s building trade. Sponsoring the project are Morgan, Walls and Clements, Dodd and Richards, Reginald D. Johnson, Webber, Staunton and Spaulgin, Carlton Monroe Winslow, Elmer Gray and McNeal Swasey. The big announcement is made in February 1927 about the $650,000 height-limit to be built on the southeast corner of the Fifth and Figueroa. To be known as the Architect’s Building, after New York and Chicago, it would be the third of its nature in America: a whole structure exclusively devoted to the various branches of the construction industries. It is to be of a “modified Italian” architectural treatment according to the associated architects drawing up the specifications: Roland E. Coate, Dodd and Richards, Reginald D. Johnson, McNeal Swasey, Carleton Monroe Winslow, and Witmer and Watson. Twelve stories high, with a site of 60 by 156 feet, it is to be of steel reinforced concrete, 143 offices, its exterior finished in plaster with cast-stone trimmings. Its seven upper floors of the building are to be leased to prominent architects, its first floor and mezzanine to be occupied by the Metropolitan Exhibit of Building Materials—a massive exhibit of every branch of the building industry, renamed the Architects’ Building Materials Exhibit. By November of 1927, the building was nearing completion. Preston S. Wright, president of Wright-Aiken, owners of the AB, ran down some of the tenants: Rapid Blueprint Company; D. C. Writhg, insurance; E. E. Holmes, insurance; William Simpson Construction Company, builders; Brian D. Seaver, attorney; and architects D & R, Coate, Johnson, Winslow, and William Lee Wollett. 816 opens in January, 1928. It came in at $662,000. The depression would not be good to the Architects’. It was foreclosed on its $360,000 outstanding bonds in February 1933. It was put under federal receivership and forced into a court-ordered sale, which didn’t occur until May of 1938, when an F. V. Fallgren and associate could pony up the 300k to a trustee representing the bondholder’s committee. The Architects’ Building survives just fine through the 40s and 50s. In 1959 it is purchased by Douglas Oil, a southern California independent who run three refineries and 300-some gas stations in the Southland. It remains the Douglas Oil building despite Douglas’ purchase by Continental Oil (AKA Conoco) in 1961. It’s the 1960s when the folk in 816, heck, the building itself, could hear the dirge of doom wafting on the wind. Listen, it’s coming from over by the Richfield building. Richfield, another oil company, who owned that big ol’ black and gold tower to the south, had merged with east coasters Atlantic Refining in 1966. Richfield had already begun buying up the block for piecemeal parking, and as Atlantic-Richfield Co. they purchased the whole kit. And kaboodle. That called for the end of the Architects’, as ARCO intended to build not one but two Miesian towers (though their New York twin-tower counterparts broke ground four years earlier, there appears to be an aesthetic epoch between AC Martin’s work and Yamasaki’s tube-frame twins of lower Manhattan, whose postmodern sensibility stems from a neo-Gothic use of aluminum). 1969, during the demolition. The Architects’ Building, now one-fifth off! The Richfield, now with two-thirds less Richfield! 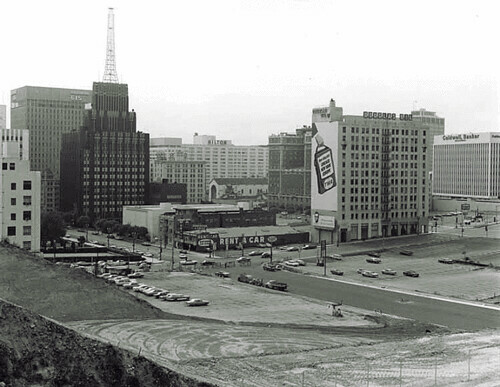 Left to right, the Tishman Building (Victor Gruen, 1960, though you know it like this), Glore Forgan Staats, the Gates Hotel (now a fine Brooks Bros), St. Paul’s Cathedral (razed), the Hilton (note how it changed from the Statler to the Hilton between 67 and 69), the Jonathan Club , the Carlton Hotel (razed), Caldwell Banker. Below, today. Note the wee bit of the Jonathan peeking out. The ARCO Towers still stand in all their glory. For now. Another shot of the demolition. The Sunkist, Engstrum and Edison line Fifth. The Telephone Tower on Grand. In the distance, left, Bunker Hill Towers going up. A mid-60s aerial. Central Library bottom right. The Sunkist at Fifth and Hope. Halfway up Hope behind the Sunkist, the tiny Sons of the Revolution and the Santa Barbara. The big apartment building at the southwest corner of Fourth and Hope was the Barbara Worth. Note how Fourth Street ends at Flower. Compare to the 60s aerials which indicate the magnitude of the 1954 Fourth Street Cut. Just to clear up one bit of confusion. Despite early mention that this building was to be of the combined effort of Roland E. Coate, Dodd and Richards, Reginald D. Johnson, McNeal Swasey, Carlton Monroe Winslow, and Witmer and Watson…it’s a Dodd and Richards. 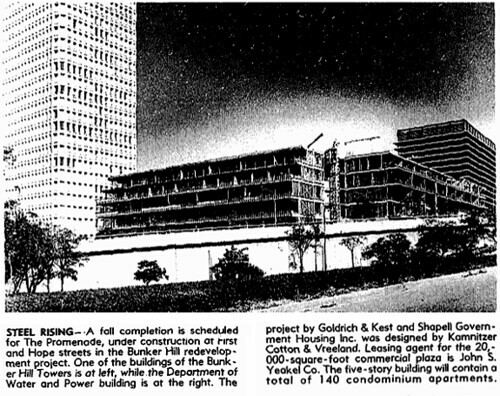 Even Adrian Wilson, who in April 1967 wisecracked “I hope our new location won’t be so temporary” in an article about his having to move out of the AB after thirty-nine years, remarks that Dodd and Richards designed the building—and he should know, the plans for 816 are inscribed with his own initials, as he was their draftsman before he hung out his own shingle when the building opened in 1928. That then is the tale of the Architects’ Building at 816 West Fifth. Remember the diaspora the next time you’re in the neighborhood. Folk will on occasion ask me what, if anything, is left of Bunker Hill. Glad you asked, I’ll reply, answer being, nothing really, but I am awfully fond of this particular dirt contour. If they don’t politely turn away, I’ll commence upon a detailed discourse on said excrement-laden dirt contour in question, and then they’ll politely turn away. And I thought, I know that form. That contour. Like a beautiful woman in repose. Debased somehow, but still noble. Ingres’ Odalisque has become Manet’s Olympia. So here I am in pith helmet and plus-fours, poking around the strangely stained abandoned sweatpants and taking in the stench of urine steaming away on a hot summer’s day. My own Persepolis, only with more recent death and egesta. A remaining honest remnant of Bunker Hill, carved in dirt. There’s an old Yiddish proverb—Gold’s father is dirt, yet it regards itself as noble. Let’s take a detailed look at the block our patch of dirt calls home. In 1888, on the 30-40′ bluff overlooking Hill there’s a large house, center, and another (with a “old shanty”, it is noted) at the corner of Second and Hill. The round structure above the house on the right reads “arbor lattice.” Note the porches on the Argyle. It’s 1906, and much has changed: our little friend in the corner has disappeared. In its place, just to the north, two lodging houses at 411 and 409. To the west, Hotel Locke. (Hotel Locke shows up in the Times in 1897 and disappears in 1912.) Olive Court has wrapped around and filled in, and the tennis lawn has given way to our old friend the Moore Cliff. The former single family dwelling at 109 has been enlarged to become the El Moro Hotel. Note the Hotel Cecil in the upper right. Hill now has a 15’ retaining wall; the houses average 30’ above grade. But now it’s 1950 and the drastic has occured. Where once Second Street was sixty feet across, it is now 100, due to the construction of the Second Street tunnel, which opened in July of 1924. (As Mary mentioned in her post, the Argyle lost its porches.) Also lost were the two structures below the Primrose at 411 and 409, not to mention the Hotel Locke. These were even gone before the great excavation. The Hotel Cecil has, as you might imagine, been renamed, so as not to be confused with the Hotel Cecil. We even have a little gas station. sat) as seen in the 1932 photograph? As can be barely viewed just below the Moore Cliff in the ’32 shot, a lot fronting Hill has already been excavated for auto parking, and in May of 1935 the two adjacent lots at the corner were leveled by Los Angeles Rock and Gravel, removing 40,000 cubic yards of earth adjoining the tunnel ramp, measuring some 45hx82wx157d’. One lot owner, C. J. Heyler, rented the space to P. F. Drino for automobile parking; Heyler stated that construction on the lot was planned. That, of course, never happened. This, then, is how we ended up with Hill carvings that have remained unchanged for seventy-three years. And still fulfilling the same purpose. A quick word about the Second Street tunnel—with the millions the CRA is again pouring into Bunker Hill, do you think we could throw a few bucks toward a new railing? To refashion the original concrete couldn’t run that much, and if not an aesthetic improvement, would be arguably safer than chain link. Right? In any event, such is the tale of some simple dirt on a single block. Tune in next week for tales of terror as they relate to this part of the world. And now, you can launch into your own spiel about the dirt contours of Hill Street. I suggest a visit and have a whiff for yourself of what once was Bunker Hill. Serves to add that dose of realism guaranteeing the polite turning-away of cocktail party folk. Images courtesy Arnold Hylen Collection, California History Section, California State Library and USC Digital Archives; special thanks of course to D. A. Sanborn, his map company, and the anonymous field men who toiled on the fire insurance maps Sanborn Co. produced. The Battle of Bunker Hill, 1775, was fought with the smoothbore flintlock musket, the odd Jäger rifle, and muzzleloading cannon of ship and field. They also fought in formation, in the open, using the linear tactic—both sides (it’s a myth that during the Revolution the reb militia hid behind rocks and trees and picked off those Redcoats standing in a row). This was a thoroughly Enlightenment style engagement. The Second Battle of Bunker Hill, waged in 1957, evidences a devolution of society; its craven assault waged with the antiquated arrow. Hardly the shower of arrows we saw at Agincourt or Thermopylae, but still. It’s April 25, 1957, and a demolition crew is hard at work tearing down “an ancient frame dwelling” at First and Hope streets. Charles Ousley, 25, is standing in the bed of a dump truck when an arrow whistles by. He alerts John Trott, 30, crew foreman, who picks up the feathered shaft and gazes upward. In a third-floor window of the Rossmere Apartments across the street, he saw a man with a five-foot bow. Police pounded up to the apartment but found the archer had flown as swiftly as had his arrow. Prefiguring Oswald’s abandoned Mannlicher-Carcano, authorities recover the bow in the room. Neighbors fingered the culprit as one Albert Duarte, 20. “He got tired of hearing that racket all day,” one of them explained. “I’m tired of these prima donnas,” grumbled Trott. February 27, 1911. It’s 9:30am, and Melrose Hotel manager Mark C. Bentz—nephew of M. W. Connor, owner—was in the office when stifling fumes and a dense cloud of smoke began to rise from the floor. He dashed down the stairs and into the basement where, in smoke so dense he nearly suffocated, managed at great length to extinguish the conflagration. Bentz discovered newspapers wadded up between the beams, blackened and scorched. Bentz and Connor went searching through the house, cellar to garret, for some sign of a stranger, and were about to give up when the office again filled with smoke. Again there was a dash to the basement…nothing. This time the smokey cloud was emerging from the elevator shaft. San Bernardino papers (aha!) were extracted, smoldering, from between wooden beams therein. This time Bentz and Connor summoned the authorites. Good thing, too, for as Sgt. Hartmeyer approached the Melrose, he saw smoke billowing from the structure…two alarms were sent to the fire department, a door and several windows were broken open, and a large clothes basket, filled with paper, blazing furiously, was doused. The original Melrose Hotel, 130 South Grand, was a thirty-room, five-story structure built by Marc W. Connor (on what was then called Charity Street) in the summer of 1889. Its architect was Joseph Cather Newsom. It was a center of fashionable goings-on, and society spectacle, and place of repose for honorable peoples. In early 1902 Connor erected the far more box-like Melrose Hotel, its architect Thomas J. McCarthy, at 120 just to the west of his cupola’d wonder, which became its annex, connected to the hotel proper by an arcade. The dual Melroses persevered, all ornate of railing and careful of mitering, through the decline of, well, just about everything. By 1957, time had run out for the Melrose (one could say that Melrose place had been, if you will, canceled). And so, it being 1957, the Melrose had to go. Ah, the March of Progress. One can hear it goosestepping along, even now. In any event, should you wish to visit the site of the former Melrose, please patronize this parking structure.